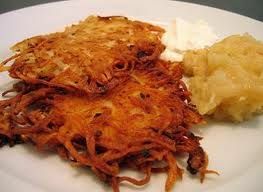 It isn’t Hanukkah without Potato Latkes, those wonderful, crispy pancakes of shredded potato and onion served with apple sauce. It’s lot easier than when I was growing up in the 50’s. Back then we had to shred them with a metal grater that often resulted in some shredded knuckles, too. Food processors have saved a lot of knuckles and teary eye from shredding the onion. This recipe is really simple. The trick to getting latkes that hold together and aren’t “oily” is the potato. Idaho’s win, hands down. Traditionally, according to kosher law, when latkes are served with a fish meal they are fried in oil and served with sour cream. If they are served with meat, they are fried in chicken fat and served with apple sauce. Since, I haven’t kept a kosher kitchen in over 40 years, I fry the latkes in oil and serve both apple sauce and sour cream. Because this recipe has no flour or egg, the latkes are more delicate and lacy. These are best served when they are fresh from the pan, so, we take turns making them all during the meal. It can actually be fun. 4 large Idaho potatoes, about 2 1/4 lbs. In a food processor with a coarse shredding disc or o the large shredding hole of a hand grater, shred the potatoes. Squeeze them well to rid them of as much water as possible and place them in a bowl. I use a cotton dish towel to squeeze the water out. it gets them really dry. Shred the onion and add to the bowl. Add the salt and pepper. Mix well. More water will be exuded and should be squeezed and drained thoroughly. In a large heavy frying pan (a 12 inch iron pan works best), over medium heat, heat 2 tablespoons until a slight haze appears on the surace of the oil. Drop about 1/4 cup of the mixture into the oil, flattening slightly with the back of a spoon Leave a little pace between the pancakes for ease in turning. They should be about 2 1/2 inches in diameter and will flatten as they cook. Cook about 7 minutes or until the edges turn golden brown. Flip and cook another 5 to 7 minutes or until the other side is golden brown. If the oil starts smoking or the latkes brown too quickly, reduce the heat and briefly remove the pan from the heat. Remove the latkes and drain on layers of paper towels Continue with remaining mixture adding 2 tablespoons of oil with each batch. Serve with apple sauce and sour cream. Bon Appetite and Happy Hanukkah!